World no. 1 women's tennis doubles pair Sania Mirza and Martina Hingis have decided to end their partnership. The pair has won nine titles together in 2015-16. 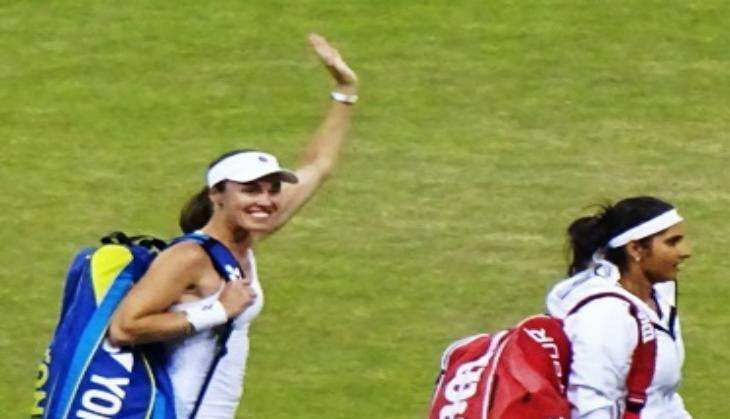 According to Sportskeeda, Mirza will now partner Barbora Strýcová of the Czech Republic, while Hingiz will partner Coco Vandeweghe of United States of America at the upcoming Cincinnati Masters. The reason for the split was the pair's poor performance in the last few months, which saw them win only one major tournament and lose to lower-ranked opponents on multiple occasions, reports ESPN. Coco, 24, won the US Open Juniors title in 2008, and in 2015 she reached the semi-finals of the US Open with partner Anna-Lena Gronefeld of Germany. The Santina pair was one of the most successful women's tennis pairings in recent years, winning titles at Wimbledon and the US Open in 2015, and this year at the Australian Open, reports Sportskeeda. The pair having won the Australian Open early this year, and two WTA titles - in St Petersburg and then at the WTA Italian Open, have not been able to replicate their successes of 2015, ending that year as the top-ranked women's doubles pair after early or unexpected losses in various tournaments this year. Mirza will partner Rohan Bopanna in the mixed doubles at Rio 2016, with their first match to be played tomorrow. Their opponents are as yet unknown.